Civil War Pension Index Cards of Newton Earp, James Earp, and Virgil Earp. Wyatt Earp's Older Brothers Served the Union Army in the Civil War. 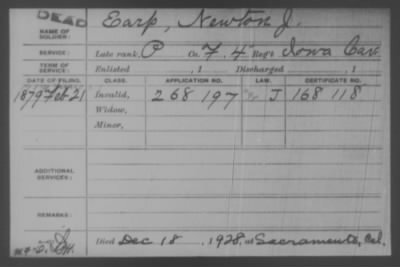 Stories about Civil War Pension Index Cards of Newton Earp, James Earp, and Virgil Earp. Newton Earp, the half-brother of Wyatt Earp, was roughly 24 years old when he enlisted in the Union Army. Newton was a Private in Company F, Regiment 4 of the Iowa Cavalry. Newton served the Union Army for the entirety of the Civil War. To the right I have attached Newton's Civil War Pension Index Card; filed on Feb 21, 1879. In order to see this image you will need to register for a free user name. You will only need to give your email address and then choose a password. Once you have become a free member you will be able to see the image attached to this Story Page.